The stash of gin that we jetted halfway across the world with gave out in Hanoi. We really enjoy the local Hanoi beer scene, but sometimes you want something else. 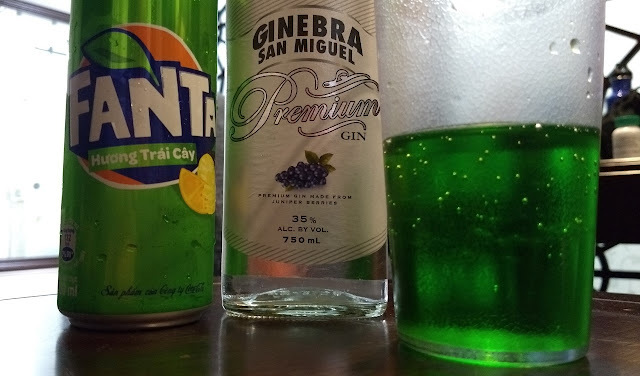 The only gin we found locally was was "Ginebra San Miguel Premium". I was surprised to learn that San Miguel gin, distilled in the Philippines, is the most consumed gin in the world. It turns out that Filipinos really like their gin, and San Miguel pretty much has a lock on making the stuff. So, we bought a bottle and gave it a try. Woof - not for me! It has juniper flavor, but also an odd, sweet overtone I really didn't like. This is probably because it is distilled from sugarcane - save that for my rum, please. Mixed with tonic, it really wasn't good. We tried it with some other mixers, including what you see pictured above - an innocent-looking soda in a can with citrus fruits on the side. It turned out to be green and tasted like cream soda. Mixed with the San Miguel gin, it tasted better than it looked. But only marginally.